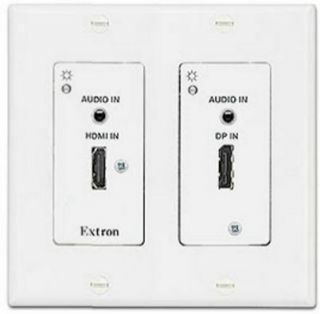 The DTP T DWP 4K D series from Extron Electronics consists of two input Decora-style transmitters for sending DisplayPort or HDMI, audio, and control over a shielded CATx cable to Extron DTP-enabled products. The DTP T DWP 4K 232 D extends signals up to 230 feet, while the DTP T DWP 4K 332 D extends signals up to 330 feet. Both DTP T DWP 4K D models include one HDMI input, one DisplayPort input, and independent analog stereo audio connections. They support video signals at resolutions up to 4K, including 2560x1600 and 1080p/60 Deep Color. Analog stereo audio embedding and RS-232 remote control help with integration into professional environments. Additional features include EDID Minder, auto-switching between inputs, remote power capability, and bidirectional RS-232 and IR pass-through for remote AV device control. The transmitters can also be mounted to a wall. "These 4K DTP transmitters enable system designers and integrators to take advantage of DisplayPort technology alongside HDMI sources in a range of AV environments," says Casey Hall, Vice President of Sales and Marketing for Extron. "Features such as automatic switching and audio embedding simplify designs and provide ease of use." The DTP T DWP 4K 232 D and DTP T DWP 4K 332 D automatically adjust color bit depth based on the display EDID, with the goal of preventing color compatibility conflicts between the source and display.